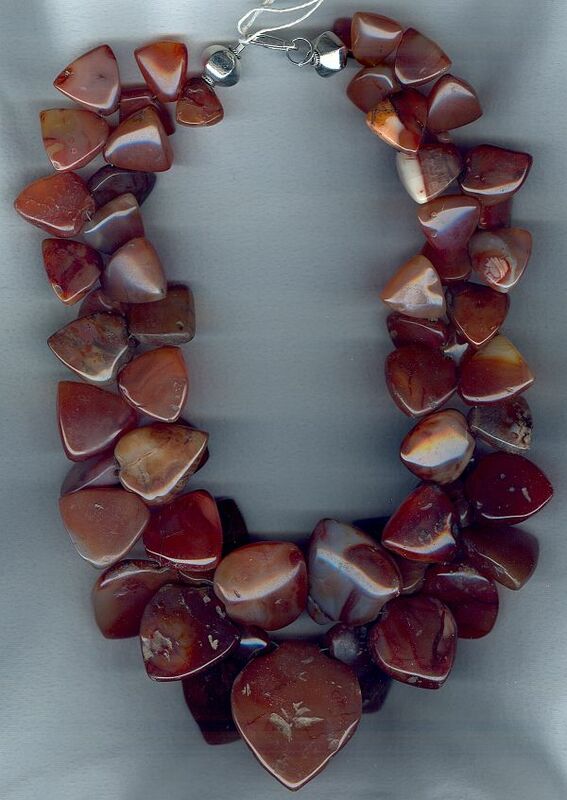 A carnelian bead necklace can range in color from a fiery red or deep orange to a rich brown or vibrant yellow. The carnelian bead colors create elegant necklaces that are striking to look at and fashionable to wear. Carnelian, a beautiful stone in its natural state, is reddish brown to orange in color. The elegant reddish color comes from iron oxide that is in the stone giving it delicate variations in color and a striated look. Carnelian, a member of the quartz family, is a type of chalcedony. Although carnelian is found throughout the world, most of the carnelian that is used for today's exquisite jewelry comes from India, Australia and North Africa. Transforming the natural stones into beads is a process that requires heating and shaping of the stones several times until the desired gemstone is roughly completed. Then the gemstones are ground, polished and drilled completing their transition from rough stones to carnelian beads. Necklaces that are made from heated beads generally have a richer more intense color then necklaces made from beads in their natural state. 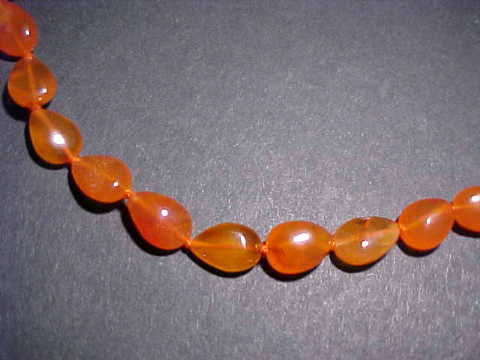 A cabochon cut, which is smooth and rounded, is a popular cut for carnelian beads as it shows off each gemstone's natural elegance and beauty . The cabochons can be of various shapes, such as round, oval or pear. The following are two beautiful examples of carnelian cabochon beaded necklaces. 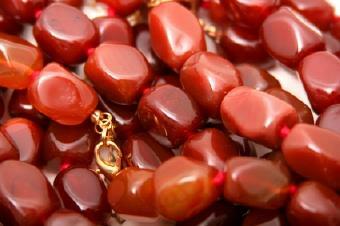 Carnelian beads that are faceted have been cut to give them more of a vivid sparkling effect. Faceting brings out the rich color tones of the gemstones and adds to the stone's natural brilliance. Prized in ancient times, carnelian was believed to have many special powers. The people of the time believed it would protect anyone wearing it from evil spirits and weapons. It was considered so powerful that mummies of ancient Egypt wore carved carnelian necklaces to protect them on their journey from the world of the living to the world of spirits. Ancient Touch offers six exquisite beaded carnelian necklaces dating from the II century B.C. to the IV century A.D. The authenticity of each antique necklace has been carefully researched and documented. A stunning one of a kind beaded carnelian necklace from Tibet is offered by One of a Kind Antiques. Dating from the mid to late 19th century, this exquisite necklace includes silver beads, large antique carnelian beads with the one inch center stone exquisitely framed in hand chased silver and is priced at $950. Mineral Miners offers a beautiful selection of carnelian necklaces priced from $5.95 to $114.50. Please scroll down to the bottom of the linked page to view their necklaces. LVJ Designs creates unique custom designed jewelry including a beautiful beaded necklace of triangles and hearts made from antique African carnelian gemstones. This unique necklace is priced at $365. With the wide assortment of styles and designs of carnelian bead necklaces, there is sure to be one that will be a perfect fashion accessory for your wardrobe.